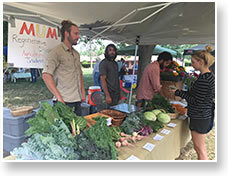 Students in MUM’s Regenerative Organic Agriculture Certificate Program started selling the fruits of their harvest at the Fairfield Farmers Market just a few months after they began working on the student farm. 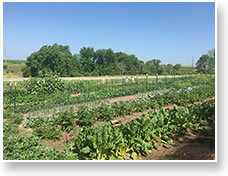 They have been growing a wide variety of produce, including salad greens, radishes, kale, chard, peas, zucchini, tomatoes, beans, sweet corn, carrots, and melon. The 10-month certificate program began in January with students taking classes in business, soil science, and biodynamic agriculture. 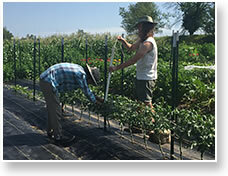 In early spring, they started seeds in the greenhouse, then planted their crops on the plots at the new Petra Stanley Regenerative Organic Agriculture Center north of the MUM campus. Students have tilled the ground, made rows and raised beds, aerated the soil, learned to make and apply compost and compost tea and organic garlic-based pest repellent. They also learned how to irrigate, weed properly, and put up trellises. 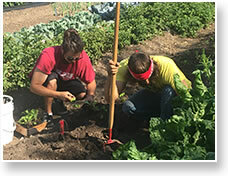 In addition to the various growing techniques, students also engage in team building and farm management practices. “We are always working as a team and communicating about what we need to do,” said Theodore Sanler. In addition to selling the produce at the farmers market, the group also sells to Everybody’s Cafe, and they plan to expand their markets soon. Students can also take home what they grow for their own consumption. The students in the program come from diverse backgrounds and their career plans are just as diverse. They aspire to become farm managers, establish their own farms, write books, educate veterans about sustainable agriculture, and get into urban gardening. Learning how to farm is not the only reason students have joined the program. Armando Castillo chose MUM because of the Transcendental Meditation® technique, the healthy lifestyle, and Consciousness-BasedSM education. Armando wanted to begin working on his personal development and acquire good habits for the future. “I felt like I could get a lot of growth done to set me on my way,” he said. 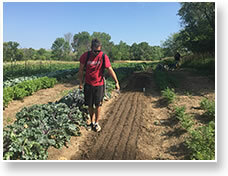 Starting this fall, the Department of Sustainable Living is offering a new BA in Regenerative Agriculture Program for those wishing to get a degree in these sustainable farming methods. Shop online at AmazonSmile and the University will benefit from your purchases. of this communication in any form is prohibited without permission. Transcendental Meditation®, Maharishi University of Management® and Consciousness-Based are protected trademarks and are used in the U.S. under license or with permission. To unsubscribe, reply to this email with ‘unsubscribe’ in the subject.